The Shard, London’s tallest building, has a viewing platform at the top, the The View from the Shard. To access the platform, you use two lifts, the first from the 1st to the 33rd floor and then a second lift from the 33rd to 68th floor. The viewing galleries are then on the 69th floor (inside) and 72nd floor (outside), above which the Shard continues to taper to the 87th floor. Transferring between the two lifts, visitors walk over a large map that covers the floor and walls of the sky lobby there. The Shard themselves describe the map as a “graffiti word map” but I would consider it a nicely designed typographic map, that is, a word-based respresentation of the capital. The location of the Shard itself is shown as a discrete red dot, the rest of the map being made of of main roads, the River Thames, and two hundred sentences, that “flow” through rather nicely through the gaps between the mapped roads. 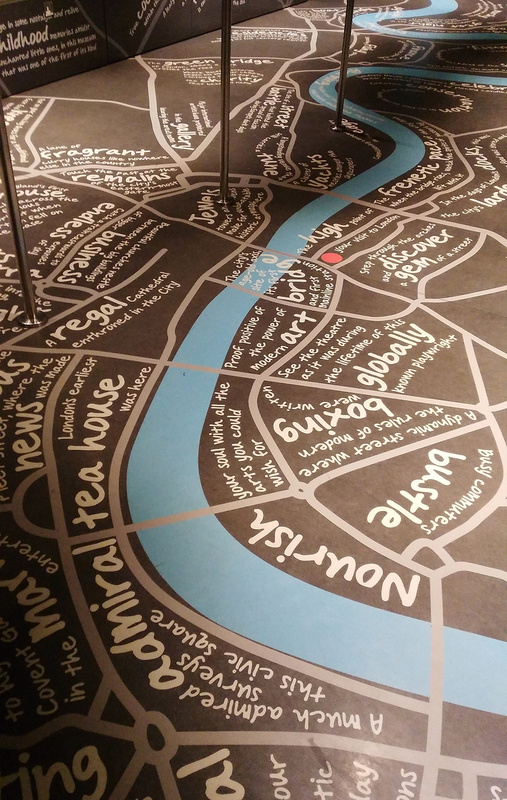 The map is arranged around a corner, and carries on up on the walls too, so forming a rather unconventional way of looking at London’s layout – rather like the viewpoint itself. Each sentence is a description of a well known local feature of the area, without naming the feature itself, so providing teasers for visitors waiting for the next lift. For example, “Where houses line up like a slices in a toast rack”, corresponds to the Toast Rack area of Wandsworth – I must confess I’d not heard of this one before! 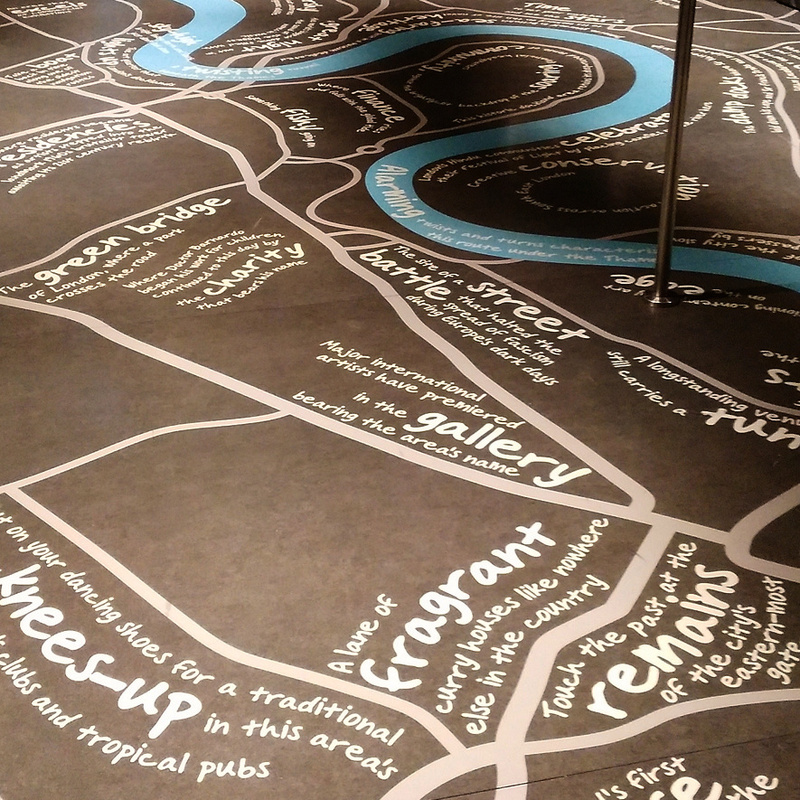 The River Thames itself remains on the floor part of the map and so provides the focal feature for the visitors to walk along to get to the next lift. The corner of the route corresponds to the 90-degree turn of the Thames near the London Eye and Waterloo. I like that the cartographer and the Shard resisted making this an overly colourful or detailed map, instead using a dark brown, cream and grey/blue palette which matches the rest of the general muted theming of the View from the Shard experience – that very much lets the view itself, and London’s lights and colours, speak for themselves. The inscriptions are pitched at the right level of intrigue – most Londoners should get most of the references, while tourists who have done their research should work out a few of them too. Thinking of seeing the map and the Shard for yourself? 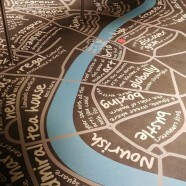 See my review of the view experience and getting the Londoner discount card. Thank you to DiamondGeezer for blogging about the Love London pass, which is a great way for Londoners to visit the Shard this year, at a considerable cost saving compared with the tourist tickets. As a visitor to London who just visited the Shard yesterday and so walked on this map, it was nice to read a post about it allowing me to learn more about this map.